SUMMARY: My War on Drugs rant condoning decriminalization. SUMMARY: My review and definitive post on cocaine kingpin Pablo Escobar. SUMMARY: Brief overview of Plan Colombia, the US-funded strategy to stabilize the country. 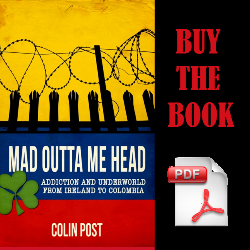 SUMMARY: Short story on paying paisa cops who caught me with cocaine in Medellin, Colombia. SUMMARY: I spent my first weekend in Medellin with a couple Americans living there. Highlights include My 3rd Time Bribing Cops in Colombia FAIL and Envigado: Night of the Freak Shows. SUMMARY: Overview taken from Michael Reid’s Forgotten Continent on the history of the cocaine industry in Colombia and its economic implications. SUMMARY: I got drunk and did cocaine with shady people in the shady club, La Cascada. SUMMARY: The story of John Rowley, a British conman and gangster, includes famous heists, jaw-dropping excess and drug abuse, prison, and an early death. Told by The Mick. SUMMARY: From Colombia I smuggled marijuana, cocaine, steroids, and Sinalgen (Colombian Vicodin) into the States. SUMMARY: Scopolamine is a powerful sedative commonly used in robberies, assaults, and rapes in Colombia. This post tells a few scopolamine stories and discusses the urban legends. SUMMARY: I describe panhandlers, bums, and drug addicts in Bogota, Colombia. SUMMARY: Introducing a new character to this blog, The Mick, who moved to Colombia in the 80s to bring cocaine to Ireland. After four years in prison, he never went back.